The Australian Lloyd Cahill, born 30 January 1914, joined the army in 1940, two years after he had finished his Medicine Studies. He became a Regimental Medical Officer with the Australian 2/19 Battalian, that was sent to Malaya. In 1942 he was taken prisoner of war at the Australian hospital, established at St Patrick’s School in Singapore. April 1943 he was sent with the ill-fated F Force to Thailand to work on the notorious Siam-Birma Railway. He was the doctor at the Cholera Hill, at the Shimo Sonkurai Camp. The day after he arrived there was an outbreak of cholera. Lloyd was in charge of the isolation ‘ward’, built of bamboo stagings with canvas covers. To keep the men alive, he hydrated them with water from the camp waterfall mixed with salt stolen from the Japanese kitchens. When the railway was completed, Cahill and the surviving prisoners were sent back to Changi in 1944, where he spent the remainder of the war. He returned to Australia in 1945. He landed in Darwin weighing 47 kilograms. After the war Lloyd Cahill became an ophthalmologist in Sydney. He did not talk much about what he had gone through. Even in his later life, when he opened up a little bit about his warexperiences, he only spoke about the funny side, never about the suffering and certainly never about his own bravery. His modesty also extended to his personal subjects. After his death in 2012, at the age of 98, his family found degrees and career awards just rolled up and kept in a tube in his bedroom cupboard. 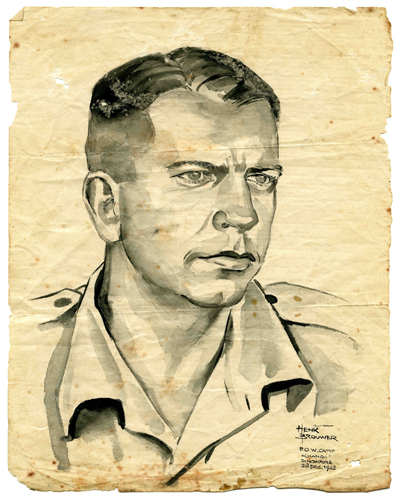 Amongst his possessions they found the portrait that Henk Brouwer made of him in Changi on 28 December 1942.